I have tried this recipe dozens of times lately hoping to reach to a good combination in the wood fired oven. 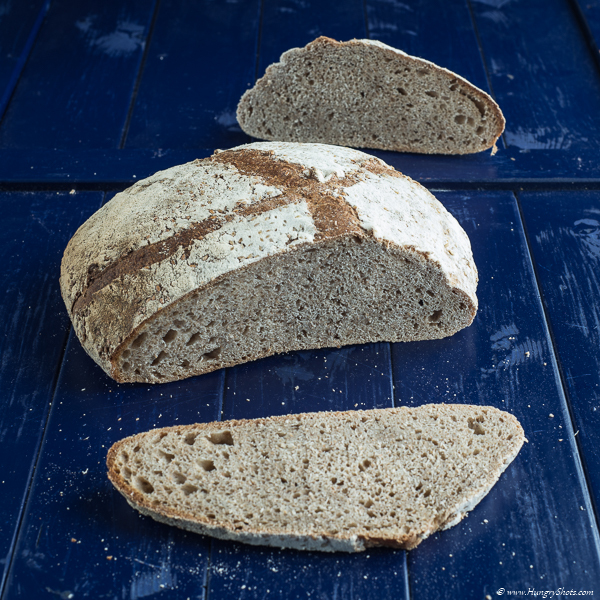 The author of this recipe recommend baking this bread in a dutch oven but I wanted to use the wood fired oven. First, I have tried to make the bread in one piece so I ended with a big loaf. While trying this, I ended up 2 times with an unwell cooked bread: burned on the outside and sticky in the middle of the crumb. I have tried putting a metallic cover on top of the bread to take advantage of the trapped steam but I didn't find any difference. Also, using the original recipe, with 700g of wheat flour instead of 800g as mine was leading me with a dough that was falling quickly on the peel and was very difficult to slide it down in the hot oven. Adding 100g more flour solved the issue but I remained still with an unstable cooked bread. So I gave up on doing a big bread and split the dough in 2. That solved the issue of the uncooked bread. As it is a high percentage whole wheat bread you should not expect to have an incredibly tall bread with big wholes in the crumb. The most important thing is that with these trials it didn't happen at all for me to throw away the bread. Everything was completely eaten. Now that I have reached to this acceptable recipe from all points of view, I am read to present it here. Another nice trial would be to use the conventional oven and follow the author's recipe by the book. Until then, here it is my well tested recipe. Day 1 22:00, prepare the preferment by mixing all ingredients in a bowl and let it covered at room temperature (19ºC) for 8-12 hours. Day 2, 9:15AM, in the mixer's bowl add the water, the 2 types of flour and the gluten powder. Start the mixer for 3 minutes just to insure that all ingredients are well mixed. Let the dough rest for 50" (autolyse phase). Day 2, 10:05 AM, add the preferment, salt and mix well for 15 minutes. Day 2, 10:20 AM, cover the bowl with a lid and do the bulk fermentation. During this time do 4 stretch and folds (at 11:00; 11:30; 12:00; 12:30). Day 2, 14:15, take out the dough from the bowl and put in on the board. Divide and preshape 2 boules. Day 2, 14:30 Let the dough rest for 15". Day 2, 14:45, shape the 2 loaves and place them in floured round bannetons. Day 2, 15:00 Do the final fermentation until 18:00. Day 2, 17:20, 40" before the bake, preheat the wood fired oven and let it reach down the temperature at 280ºC. How much it takes for you oven to reach this temperature it really depends on your oven. You should know your oven before baking bread in it. Day 2, 18:00, score the bread with a sharp blade. Put immediately the loaf inside the woodfired oven. Bake for 25 minutes but check after 10 if they are not too brown only on one side. If this is the case turn them 180º with a peel. When finished to bake, let them cool on a wired rack.